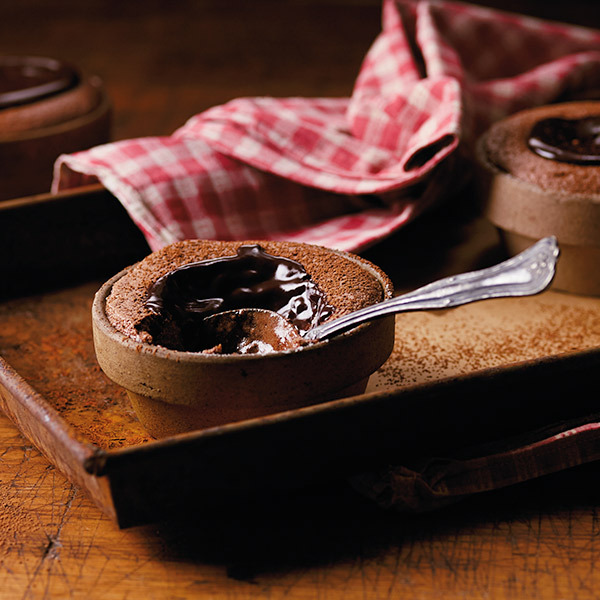 Gooey goodness overflows in these Chocolate Lava Cakes. These molten marvels require few ingredients and are deceptively easy to make. An added bonus is the individual lava cakes can be prepared ahead and put into the oven a few minutes before being demolished in a blaze of chocolate glory. Butter the ramekins, and then dust with a little cocoa powder to prevent sticking. Melt the butter and chocolate in a metal or glass bowl over a pan of simmering water. Set aside to cool slightly. In a separate bowl, combine eggs, yolks and sugar. Add the chocolate and butter mixture to the egg mixture, a little bit at a time, to prevent the eggs from cooking. Sprinkle flour over the top of the mix, and stir to blend. Pour equal amounts of batter into 6 prepared ramekins. Place ramekins on a baking sheet. Bake for about 10 minutes until the edges of each cake appear baked through. Remove from oven and serve warm. Cakes can also be carefully overturned onto a serving plate and topped with whipped cream. Tip: You will need 6-ounce ramekins or custard cups for this recipe. You may use a muffin tin, but you will need to adjust the baking time to accommodate the smaller amount of batter.